2 What is a pilonidal sinus? 3 What causes a pilonidal sinus? 4 Who gets pilonidal sinus? 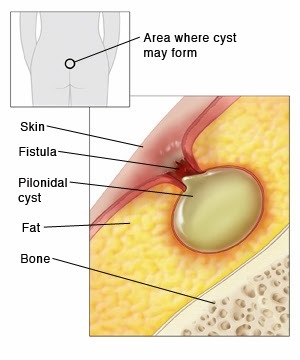 5 What are the symptoms of pilonidal sinus? The exact cause is not clear. There are various theories. For example, one theory is that the problem may develop from a minor abnormality, which you were born with, in the skin between the buttocks. This may explain why the condition tends to run in some families. Part of the abnormality in this part of the skin may be that the hairs grow into the skin rather than outwards. 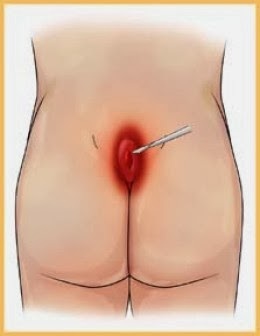 Another theory is that you develop skin dimples (skin pits) in the skin between the buttocks. These may develop as a result of local pressure or friction causing damage to the small structures below the skin which are responsible for making hairs (the hair follicles). Because of local pressure, growing hair in the natal cleft may get pushed into the skin pits. Whatever the cause, once hair fragments become ‘stuck’ in the skin they irritate it and cause inflammation. Inflamed skin quickly becomes infected and so a recurring or persistent infection tends to develop in the affected area. The infection causes the sinus to develop which often contains broken pieces of hair.